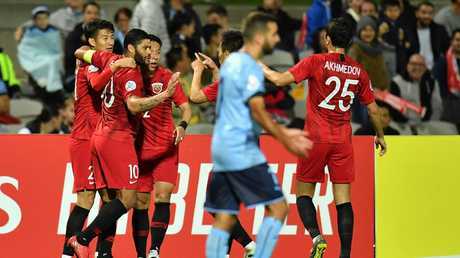 They played high-rollers for a night and gave China's riches a run for their money, but Sydney FC's Asian Champions League campaign remains in the balance after a 3-3 draw with Shanghai SIPG. Three times the Sky Blues took the lead, through Siem de Jong, Adam Le Fondre's penalty and Alex Brosque, but were thrice pegged back by their expensively assembled visitors in a helter-skelter contest befitting Jubilee Stadium's pristine pitch. Level at two goals apiece, an on-song second half chock full of Reza Ghoochannejhad chances eventually bore fruit six minutes from time as the former Iranian international missed a sitter and super-sub Brosque buried the follow-up. But hearts were broken in the 89th when $38-million-a-year man Oscar robbed Josh Brillante and slipped the ball to Elkeson, who ruthlessly punished the mistake. "It's not the best result for us," SIPG manager Vítor Pereira said. "But in the end I must be happy because our second half was in very difficult conditions." Sydney coach Steve Corica rued defensive errors but praised the overall display. "A lot of people didn't expect us to get anything here, we proved a lot of people wrong," Corica said. "We played well, scored goals. We conceded too many, but for the fans it was a great game. "Our two home (group) games we probably should have picked up more points ... but we've got a chance." 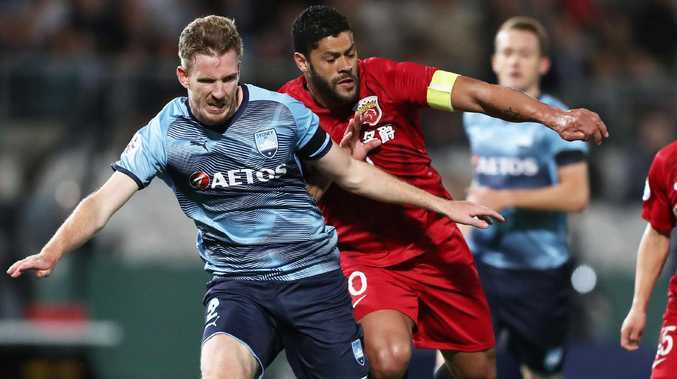 Nevertheless, Sydney remain bottom of their group on two points with three group games remaining and didn't quite reflect their mettle against the reigning Chinese Super League champions and their big-name Brazilians. And it came at a price when Michael Zullo appeared to pull his hamstring in the aftermath of a second-half challenge that will almost certainly rule him out for Saturday's Sydney derby. 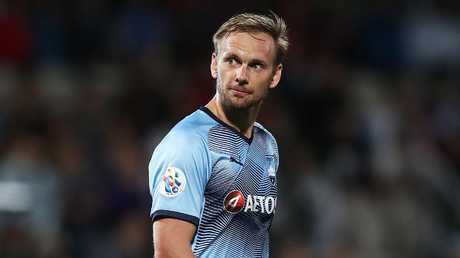 Corica made three changes to his Big Blue starting line-up, injecting Ghoochannejhad, de Jong and Danny De Silva into attack in place of Brosque, Milos Ninkovic and Anthony Caceres. Perhaps his eye was on Western Sydney, but it paid off within three minutes when Ghoochannejhad broke down the right and laid off to de Jong, who chested the ball down and smashed it via a giant deflection that wrong-footed goalkeeper Yan Junling. It was instructive that the Dutchman, Sydney's highest-paid player, earns in a season a little over what Oscar earns in a week. Many of the former Chelsea star's moments, though, were of the pure-class variety. And just before the half-hour he created an opening almost out of nothing. The customarily industrious Rhyan Grant was the victim on this occasion as Oscar cut inside and whipped a cross towards Lu Wenjun, whose glancing header was both pinpoint and pretty. Sydney hit back minutes later when the ball rushed up the other end and He Guan handballed contesting an aerial challenge in the box. Referee Alireza Faghani spotted the indiscretion immediately and Le Fondre, seemingly on a mission to break the speed record for a spot-kick, blasted into the top corner. All the while the influence of a third Brazilian in Hulk had been felt. And while the 32-year-old ex-Porto man is furnished with a pay cheque almost as sizeable as Oscar's, that appeared inconsequential when stood next to the man in the flesh. For Hulk's right quad might have rivalled Zullo for size, and the left-back had the unenviable task of tracking the colossal-yet-quick attacker, though gave a good account of himself. Andrew Redmayne for one will remember the moment he and Hulk collided, though probably less than the goal the latter created given Sydney's defensive slip. Hulk outsmarted Zullo just off the far post and curled in a cross that landed on the head of Yu Hai who, completely unmarked, duly obliged to level the ledger. That Shanghai didn't go in again was down to Redmayne, who pulled out two quickfire saves, one to deny Oscar's free-kick heading for the far post and another to divert an Elkeson volley.